#643 Old Scanton PA Fish Market Billhead! These are nice pieces of early Penna. memorabilia! Advertising billheads are quite interesting, and give us a look at life back years ago. Each is for an old business, with name, town and goods sold. Prices are often shown for products sold. 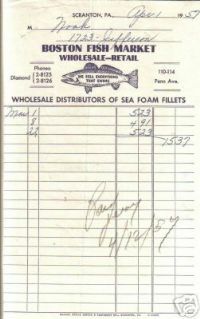 Included here is: Boston Fish Market Scranton Pa April 1 1957. A nice old advertising piece! Condition is good to very good, with minor folds, writing, marks etc. on front. Any other lines or waves are from the scanner and not on the actual item.